Currently browsing posts filed under "Parents Weekend"
Did any EphBlog readers attend Freshmen Family Weekend events? Tell us about them! I would be especially curious about Adam Falk’s Saturday Q&A. Also, can anyone identify this Eph and his family? Below the break is the full schedule of events, saved for the benefit of future historians. 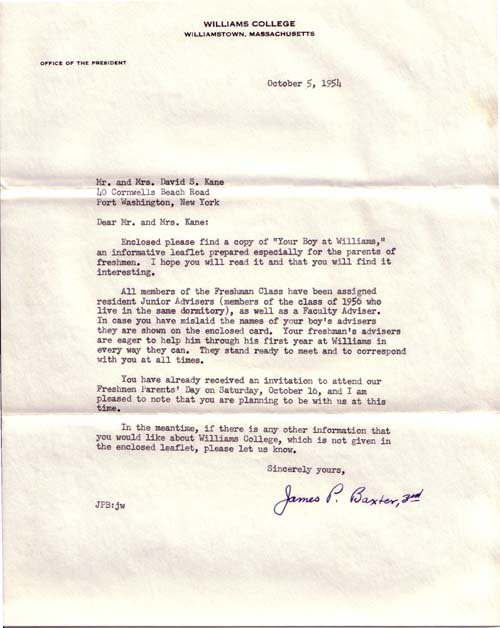 Not sure why I am so fascinated by events at Williams 50 years ago, but I can resist posting a letter from the late James P. Baxter. 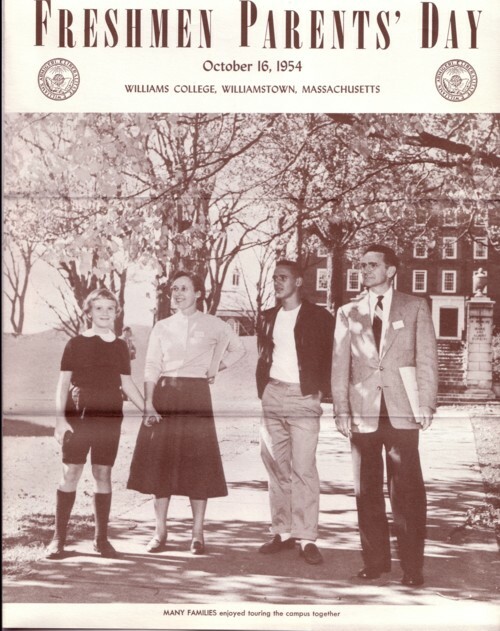 1) Again, I love the way that the letter refers to your “boy” at Williams. 2) I recall that the President Baxter was referred to using the name Phinneas, which I guess might have been his middle name. By all accounts that I have read, he had an incredibly important influence on Williams. I think that there was a great article about him in the Alumni Review a few years ago (at the time of his death), but I could be confused. 4) Note how the letter is somewhat customized, explicitly noting that my grandparents had indicated that they would be visiting for Parents Week-end. 5) I love the fact that there were JA’s 50 years ago and that there are JA’s now. If they run the JA selection process now the way it was run 15 years ago, then the notices for this year about who was accepted and who was not are about to be sent out. EphBlog is powered by WordPress and delivered to you in 0.833 seconds using 25 queries..